A few weeks ago I showed you how to use named Conditional Build Expressions to include or exclude content from your output. RoboHelp 2015 has a new feature to make tags even more useful: Dynamic Filters. With traditional Conditional Build Expressions you choose to exclude specific content from your output. Once you generate the output, content is included or excluded from the output. If you use build tags to target multiple audiences, you have to create an output for every audience. Enter Dynamic Filters: With dynamic filters readers dynamically switch the information they want to see. In the image above there are four holiday destinations in different countries. No country is selected in the Filter by area at the left so the reader sees all of the available content. If the reader selects US, only the content for the US (Mesa Verde, CO) is shown. With Dynamic Filters you can create a single output where users themselves decide which content they need. You can use this to group content by user role, by module, or by locale. Tag the content in RoboHelp. Go to the Output tab and select your Responsive HTML5 Single Source Layout. Select Use Dynamic Content Filter in the output. Click Customize to open the Dynamic Content Filter dialog box. Select the tags and expressions you want to include as a filter. Click Save to close the Dynamic Content Filter dialog box. Click Save and Generate to generate your output. Looking to learn RoboHelp? Come join me for my live, two-day online RoboHelp class (held once each month). And if you'd like to learn more about Dynamic Filters, check out my new 3-hour mini course: Adobe RoboHelp: Advanced Content Reuse. A project can easily contain thousands of topics. When you generate a layout, all of the topics are generated. But what if you want to exclude several topics from being generated? Using Conditional Build tags, you can mark topics or topic content. When the time comes to generate, you can choose to create conditions that control which tagged content is generated. Using conditions, you can maintain one large project but generate multiple layouts; each layout can have unique content. Content that is excluded from a layout is not seen by your users. Tagged content appears in RoboHelp 11 and earlier as text with diagonal lines (first image below). In RoboHelp 2015 tagged content appears with an overline. The overline makes it much easier to read the content and see which content is tagged. The downside of tagged content in RoboHelp 11 and earlier is that you can only create Conditional Build Expressions that show which tags are excluded. A Conditional Build Expression is a list of tags to exclude from your output. These expressions can get confusing because it is not always clear which tags to exclude for which situation. For example, a company has two divisions: East and West coast. Based on the name of the tag below, will the tag exclude content from the East coast or the West coast? With RoboHelp 2015 you use common sense names to easily distinguish which Conditional Build Expression you need in which situation. To create a Named Conditional Build Expression, choose Project > Pods > Conditional Build Tag and then click Create a new build expression. 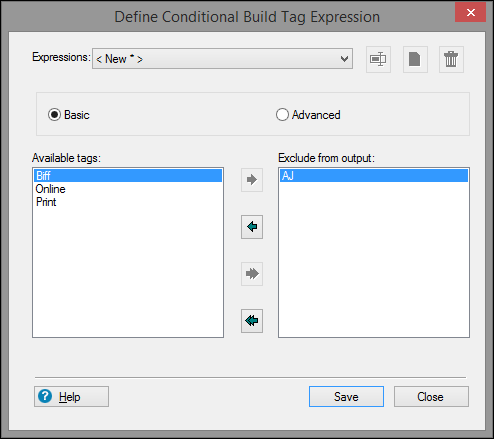 The Define Conditional Build Expression dialog opens. Double-click a tag to exclude the tag from the output and then click Save. Name the expression and click OK. If you have existing Conditional Build Expressions, you can easily change their names. Open the Conditional Build Tags pod (choose Project > Pods > Conditional Build Tag). Click Create a new build expression. From the Define Conditional Build Expression dialog box, select an expression from the Expressions drop-down menu. Name the expression and then click OK. Looking to learn RoboHelp? Come join me for my live, two-day online RoboHelp class (held once each month). And check out my new 3-hour mini course: Adobe RoboHelp: Advanced Content Reuse. 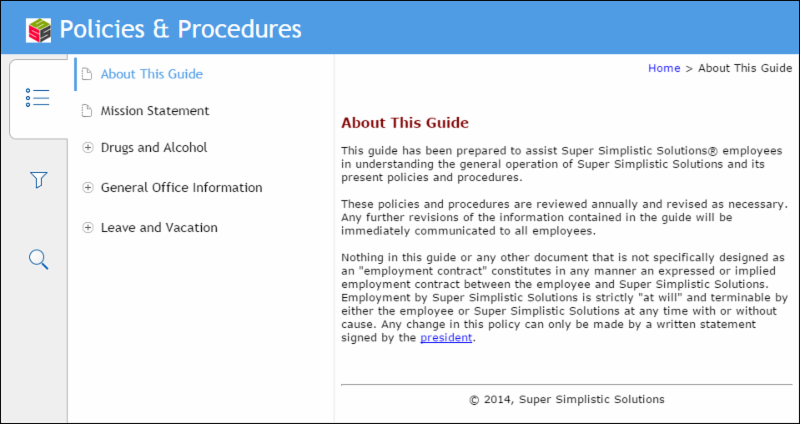 Adobe released RoboHelp 2015 last week, a major upgrade sporting several enhancements. This week we take a first look at some of the big changes. The menu has been redesigned to make RoboHelp easier to use. Options are sensibly arranged and menu inconsistencies have been cleaned up. Lesser known features like search synonyms are much easier to find and use. Small improvements, such as working with tables, make editing content much easier. One of my favorites is the Locate Item tool. Open a topic and select an image or a Captivate movie. Click the Locate Item tool and the item will be highlighted in the Project Manager. 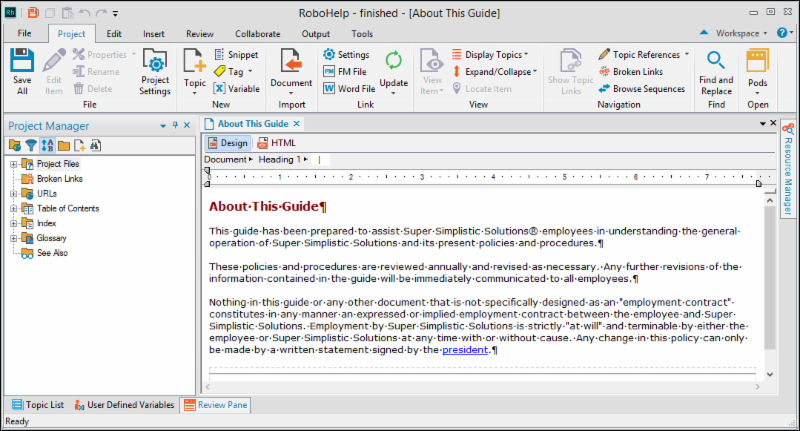 RoboHelp 2015 includes new WebHelp skins and Responsive HTML5 layouts. The WebHelp skins are clean and modern. Both WebHelp and Responsive HTML5 support Right-to-Left languages. Though for WebHelp you will have to use one of the six new skins. The Responsive HTML5 Layouts have more customization options. It is now possible to choose which panes to include in the output, just as with WebHelp. The layouts have Facebook share and Twitter buttons included as well. Named Conditions: Sensible names for Conditional Build Expressions. Dynamic filters: Conditional Build Tags on steroids. Dynamically switch Conditional Build Expressions in your output for fine grained control. Improved search results: Control the topic preview text in search results. Mobile App output: Create a mobile app without any coding. Right-to-Left: Output for right-to-left languages. Find and Replace: The Find and Replace pod has new powerful features. Scalable video: Adobe Captivate videos scale in Responsive HTML5 output. I've mentioned what I consider to be the most important enhancements in RoboHelp 2015. Stay tuned for articles on each of these enhancements in the weeks to come. How do you collaborate with Subject Matter Experts (SMEs) who aren't Adobe Captivate or Articulate Storyline developers? Specifically I'm talking about text content. How many times have you gone back and forth (and back and forth again) with your SMEs, changing a word on a slide here, removing a comma there. Maddening, right? Wouldn't it be great if you could export the text from your eLearning projects into Word, get your SMEs to make their changes in the document (using Word), and then import those changes back into your project? That kind of workflow is a dream, right? Nope. The workflow exists today in both Captivate and Storyline and the process is simple. Open or create a Captivate project and choose File > Import/Export > Export project captions and closed captions. Click Yes to open the document in Word. The captions will appear in a Word table. There will be five columns: Slide ID, Item ID, Original Text Caption Data, Updated Text Caption Data, and Slide. You can make any changes you want to the Updated Text Caption Data, but you should not change any of the other information. The Slide ID identifies which slide your edited captions go to. The Item ID identifies which caption goes with which caption data. Make your editorial changes; then save and close the Word document. The final step is to to import the edited text back into Captivate. Choose File > Import/Export > Import project captions and closed captions. Find and open the document you edited in Word. A dialog box will appear confirming the number of captions that were imported. Not only will the edited content be imported, but formatting changes made to the Word document, such as making text bold or italic, are also retained. The process of round-tripping between Articulate Storyline and Microsoft Word is just about the same as it is in Adobe Captivate. 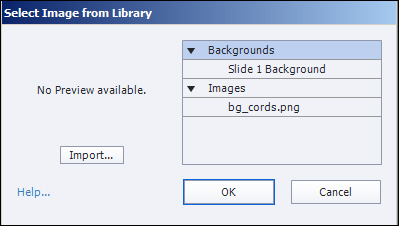 Open or create a Storyline project and then choose File > Translation > Export. In the Open dialog box, name the resulting document, specify a save destination, and click the Save button. 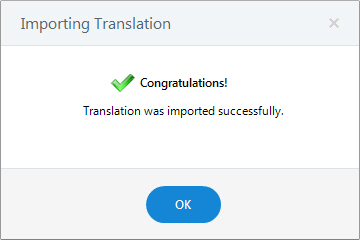 In the resulting Word document, SMEs can make any needed content changes in the Translate this column area of the document and then return the edited document to you. 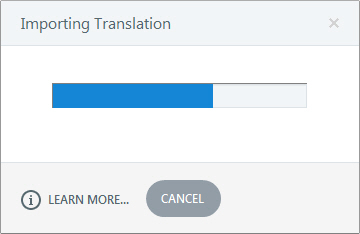 The final step is to simply choose File > Translation > Import and open the edited Word document. I've previously taught you how to create links between Merged HTML Help projects. This time, let's tackle merged WebHelp. Merging WebHelp differs from merging HTML Help in that you select the RoboHelp project to merge instead of the output. Open the master project's table of contents and click New Merged Project. On the FlashHelp/WebHelp/Multiscreen/Adobe AIR tab, click the Browse button and open the RoboHelp project you want to merge. Save your project and generate your master project. Once you've created the master project, you need to generate the merged projects to the correct folder in the master project's output folder. eLearning and TechComm: Click, Select, Choose, or Press? Right at a time when flat design has become the rage, removing the three-dimensional look that for 30 years (happy anniversary to Windows this November!) has informed us that "this thing looks like you can poke it in! It must be a button!" people are starting to worry and become uncertain about the clear vocabulary that has helped us to write about software and computers for just as long. In a recent class I had one participant tell me her office has forbidden the word "click" in favor of "select." Another told me that her office had done just the opposite! The two concerns in question are whether the word "click" loses its meaning on mobile devices, and whether the word "click" is exclusionary toward individuals with disabilities or different abilities. The good news is that using the word "click" is not ableist, nor is it declaring the hegemony of mouse users over mobile device users. It is just the standard word in technical communications to indicate "execute," on certain kinds of interactive items on screens. In other words, "click" means "hey you, button, do that thing you do." The button, as with so many things in the computer realm, is an analogy to real-world little pokable nubbins that make things happen on electric devices from vacuum-cleaners to doorbells. Even real-world buttons have undergone some changes in the ways people use them. The buttons on my microwave and stove are now flat to the surface and covered with a plastic sheet so that spaghetti sauce and porkchop grease can't get in and ruin the mechanism. But you still actuate them by pressing them--and most of them still emit a satisfying "click" sound (or a beep) when you do so. By analogy, "click" is whatever action you do to an on-screen button to make it do its thing. It is executed on various devices and by various computer users in various ways. Many of us already made the leap from "press and release the left button on a mouse device" to "press and release the left side of your mouse even though it no longer has a button" to "press and release the entire touchpad on your Mac laptop so that emits a click sound" to "tap ever-so-gently on the hair-trigger touchpad of your new Windows laptop" to "tap once on the screen of your iPad or phone" to "tap once on the screen of your touch-screen laptop" to "tab to the button and press the Enter key on your keyboard." And with Windows Speech Recognition, to actuate a button, you actually speak the word "click," as in, "Click OK;Click File; Click Bold; Click Save; Click Close," and so on. To back away from the word "click" right now is as unnecessary, and even nonsensical, as deciding that the Save icon has to be changed because no-one has used an actual mini floppy disk since 2005. The Save icon has become a symbol that will retain its meaning like other permanent glyphs, such as the Arabic numerals or the smiley face. And the word "click" is the way you indicate "actuate" for certain screen items. But that is not to say that the word "click" should be used for every screen action. By now I hope I have made clear that a "click" is a characteristic of certain screen items-buttons, icons, tools-not of the physical method by which you actuate them. So even though you may also click your mouse to execute the following actions, the word "click" is not the clearest vocabulary word for them. You "choose" something from a menu, because you are "choosing" from a list of "choices," and once you "choose" the one you want, the chosen command is immediately executed. You "select" something that, once you select it, stays selected. You select a cell in Excel. You select part of the text in a document. You select an option from a list and the option stays selected-as in a drop-down list or a list-box. You select a radio button, and you select a checkbox. And they stay selected. Until you "deselect" them. And finally, you "click" an on-screen button, an icon, or a tool. As this vocabulary discussion continues, I would love to hear your take. Is your office using "select" for everything? Are you using "press" for mobile devices? Or tap? Are you combining commands, as in "click or tap the link"? Email me. Microsoft Manual of Style for Technical Publications: "Do not use choose as an alternative to click or double-click. Choose does not convey any additional information to those who do not use a mouse, and such users normally understand the equivalent action that they must take when a procedure step says to click." Do you need to learn how to write eLearning scripts? Come check out my live, online mini course. If you've taken any of our Adobe Captivate, Adobe Presenter, or Articulate Storyline classes, you are probably aware that these programs provide a selection of screen characters--cut-out pictures of professional actors in business, medical, or business-casual clothing posed as if they are talking to you. They are intended for use as a kind of avatar of the trainer. Over the past few weeks, I've had multiple students ask how hard it would be to use themselves as the learning coach. Believe it or not, becoming a pedagogical agent is easier than you think. Put Your Picture into the Lesson. Place a professional head shot of yourself, your trainer, or expert on the introductory slide (including job title, credentials, etc. ), and then have that individual record the audio narration for the project. Create cartoons of yourself or your in-house experts. You can use the images over and over in on-going training videos. Here is one article to get you started: Using Bitstrips Characters. If you don't have specific, known individuals in your company to act as your learning coaches, you are not stuck with the same four or five actors that come with your software. You can purchase additional screen characters from The eLearning Brothers. Or you can just make good use of some inexpensive clip art. By trimming out the background in ordinary office photographs, you can get some nice effects. Whether you use generic actors or your own home-grown experts, screen characters are an excellent way to add the personalization, engagement, and local feel that will bring your eLearning to the next level. Once you have your screen characters, how do you know what to make them say? Join me for an afternoon mini course on writing voiceovers to find out. Over the years I've had more than a few eLearning development clients ask us to create links to web resources on a slide. There's more than one way to accomplish the task. Over the next couple of weeks I'll discuss some of my favorite techniques. Up first, text hyperlinks. To create a text hyperlink, select some text (the text can be contained within a text caption or a smart shape). Then, on the Properties Inspector, select the Style tab. From the Character area, click the Insert Hyperlink tool. 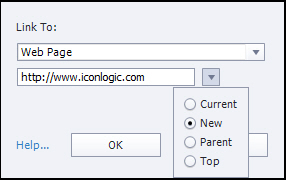 From the Link To drop-down menu, choose Web Page. Next, type a web address into the field. When previewed in a web browser, the text hyperlink will look similar to the image below. If clicked, the learner will be taken to the web address you specified in the Link To area. Should you change your mind about the text hyperlink, removing the link is as simple as selecting the text and, back on the Properties Inspector, clicking the Remove Hyperlink tool. 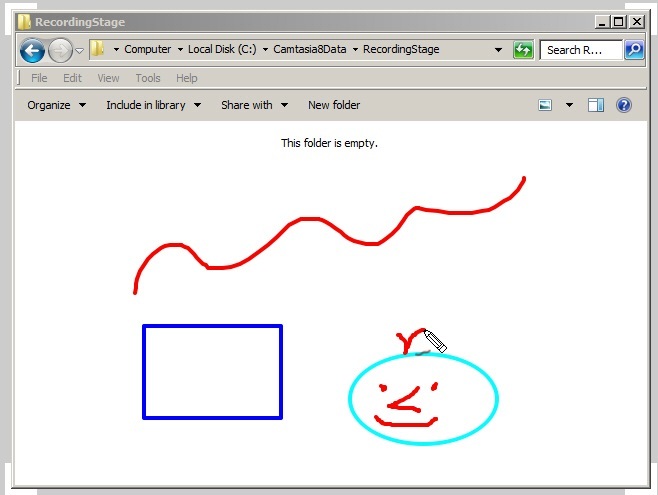 When Camtasia developers need to add attention-grabbing visual affects to a software demonstration created using the Camtasia Recorder, the work is typically accomplished by editing the recording in Camtasia Studio. However, using Camtasia's Effects Toolbar, you can add several attention-grabbing visuals while you are recording your video. Start the Camtasia Recorder. 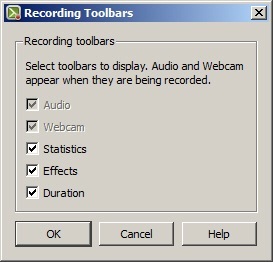 Enable the Effects toolbar by choosing Tools > Recording toolbars and selecting Effects (click the OK button to close the Recording toolbars dialog box). Create a video by clicking the Rec button on the Camtasia Recorder. 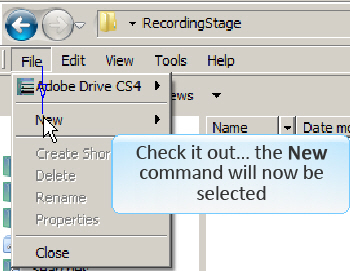 After the 3-2-1 countdown, the Effects tools appear on the Recording toolbar. Select the ScreenDraw tool to display different Drawing tools. You can select from among frames, lines, highlights, ellipses and even a pen. At this point, you can use the tools to draw all kinds of shapes on the screen (at the same time that you're creating the video). Note: You can erase all of the screen drawings by once again clicking the ScreenDraw tool. Zoom Areas are typically used to emphasize an important area of a slide background. They are especially useful if you want your learner to automatically get closer to a specific area of the screen. 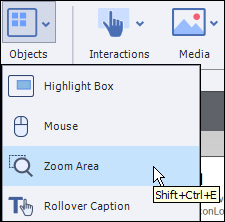 To insert a Zoom Area, click Objects on the Main Toolbar and choose Zoom Area. 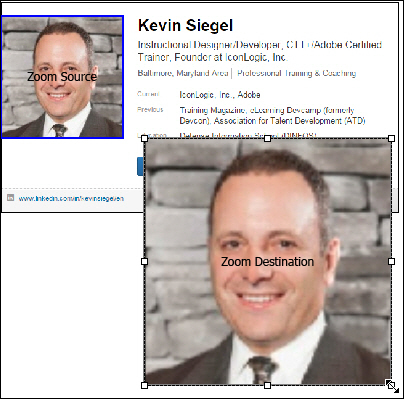 Zoom Areas consist of two parts: the area of a background that you want to highlight (Zoom Source) and where the zoomed area of the background will appear (Zoom Destination). 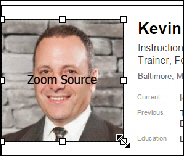 In the image below, I have positioned and resized the Zoom Source over the area of the slide background that I want to get larger. Then I positioned and resized the Zoom Destination on the slide. Remember, the Zoom Source won't move or resize when the lesson is viewed by the learner... that's the job of the Zoom Destination. Right away you can see that there is a problem with the image in the Zoom Destination. Because a Zoom Area simply enlarges the Zoom Source, and I've resized the Zoom Destination quite a bit, the image in the Zoom Destination is blurry. 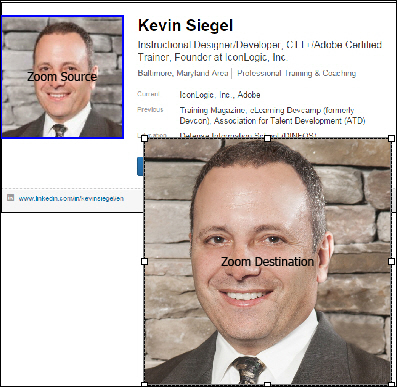 To fix the problem, you'll need a larger version of the image shown within the Zoom Source. In this case, I have the original photo of the handsome male model shown on the screen (in addition to being much larger, it has also been cropped similar to the image in the Zoom Source). 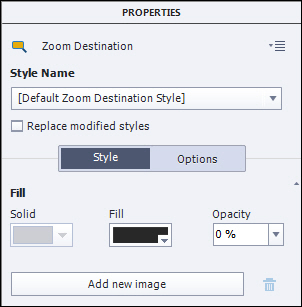 To swap out the blurry image in the Zoom Destination with the better image, double-click the Zoom Destination to open the Properties Inspector. On the Properties Inspector, click Add new image. Click the Import button and open the larger version of the photo. Compare the Zoom Destination below with the version above. The quality of the Zoom Destination image is much better. If you would like to see a free demonstration of this concept, check out the IconLogic YouTube channel.